So, let's rewind the clock a little bit... Back in March of 2017, Andy proposed to Sarah down in Florida on Hobe Sound Beach right at sunrise then took her horseback riding on the beach that very afternoon. Talk about a gal's dream proposal! Their day truly encompassed all things dreamy, as you'll see from their wedding highlight video and their photos! Now that you've seen the BEAUTIFUL overview of their day above, we're sharing our favorite images (which was nearly impossible to pick btw) from their rustic wedding at Rum River Barn & Vineyard! 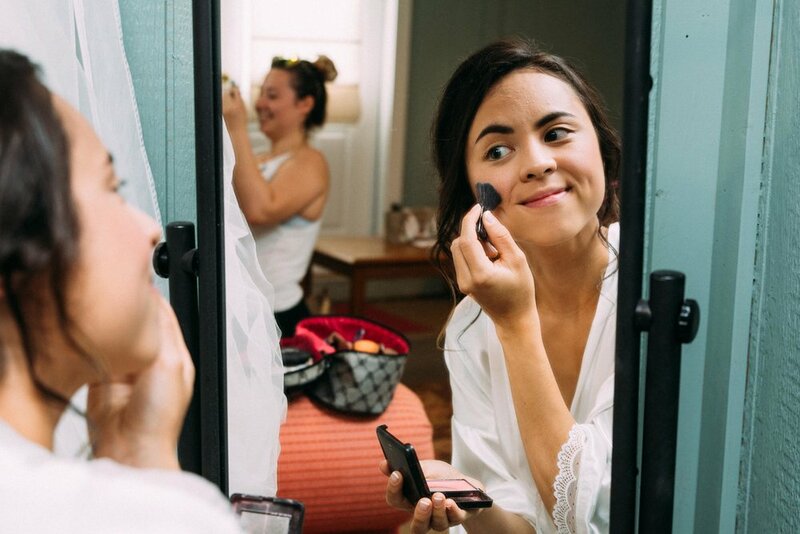 The Bridal Suite at Rum River Barn & Vineyard is beautiful and the perfect spot to get ready in with your ladies! We love first looks! But we're OBSESSED with first looks in vineyards! If you're still figuring out what colors to put your bridal party in, we highly suggest taking a close look at Sarah & Andy's bridal party! The light blue/turquoise color looked amazing on these ladies and made their bouquets stand out beautifully. Pair that with the classy, black tux and you're golden on a classic wedding party look. Some of our favorite portraits were of just Sarah & Andy! We made time for some alone time for the two of them before the ceremony and to some magic like this..
Also, ladies buy yourself a cathedral veil - WOW. Most of the month of June gave us drizzly Saturdays. Sarah & Andy's day looked like the rain would stay away no problem, but as the ceremony got closer the clouds moved in. Right as the wedding party walked to the front of the ceremony space, the rain began. We found it extremely romantic and loved that the couple committed themselves in front of their friends and family even with it drizzling. The barn at Rum River Barn & Vineyard is a dream! The twinkle lights, the decor that Sarah put together, it all came together beautifully! Plus there were cupcakes and a letter board. This wedding pulled the trendy yet not overdone pins from every woman's Pinterest board. The first dances of the reception were very special. They showed emotion. They also enjoyed the beautiful weather by having them outdoors! We snuck Sarah & Andy off of the dance floor as the sun began to set! Without a doubt, Sarah and Andy are the best of friends. The type of couple who cooks meals together while dancing to Disney music is just the start of this crazy and oh-so-beautiful journey of marriage. They also enjoy going hunting, fishing, horseback riding, camping, hiking and anything else that screams the outdoors. Date nights usually consist of dinner and the movie theater or sunset walks with their golden retriever (Leia). However, they are also perfectly content at home cuddling their pup, sharing a container of coffee ice cream and watching Disney movies. These sunset portraits feel straight out of a Disney movie! In the near future, Sarah and Andy hope to continue building their family, restore an old farmhouse, run a small hobby farm and let God take care of the rest. Sarah and Andy, we were so thrilled to capture your breathtaking day!